Can I please remind you that effective October 1st, 2012 pricing for Revelation Software’s OpenInsight SDP’s (Runtime and Developer), Annual License Renewals and the “pay for versions” of the Universal Driver will be increasing. All OpenInsight 9.x pricing will remain the same as it is now. The 64-bit version of OpenInsight is scheduled to be released in 2013 will it will have the same pricing structure as OpenInsight 9.x. Please drop me a line for a complete list of the OpenInsight 8.x and below pricing for purchases in the EMEA region. Just a quick reminder that Mike and I wil be in London tomorrow for the next Rev EMEA RUG meeting. Mike will be talking about Revelation in general and the great developments in the world of OI, I will me attempting to run through the new powerful Banded Report Writer and Andrew McAuley will be sharing some of Sprezzatura’s O4W successes following a recent O4W project for a client in Europe. If you have not already reseved your place please contact me ASAP. That you can build RDK files into a self-contained executable. During generation of an upgrade/module RDK, you may choose to have the RDK files built into a self-contained setup.exe file. The user would then only need to run the executable (and possibly answer a few questions) to have the RDK files installed. If the user name and password are specified, the executable will attempt to automatically log in (to the same application where the RDK was built). However, if they are not correct for the application, the upgrade will abort. If the user name and password fields are left empty the upgrade will instead request the user name and password from the user during the installation process. 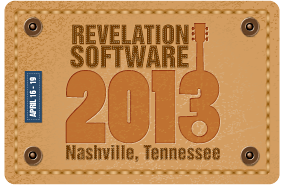 You won’t fail to have noticed that year is running away with us and plans are already well under way for the next Revelation Software Conference in Nashville, Tennessee, USA between the 16th and 19th April 2013. To be held at the Sheraton Music City Hotel, this event is sure to educate and entertain. Please contact Revelation for further details or simply watch the conference website for more details as they are released. Whilst the majority of the Revelation team will be tackling one of the many technical topics discussed during the many break out session, Nancy is currently looking for additional speakers to fill some of the sessions. If you are willing and able to take on an OpenInsight, Universal Driver or Revelation related topic, then Nancy will be pleased to hear from you. Simply drop her an email with a description of your presentation theme and a rough outline of the content and she’ll gladly consider your talk. There is no better way to raise your profile within the Revelation community and to demonstrate your skills, knowledge and professionalism to your peers and potential customers. Availability to talk at these sessions is therefore limited, so please contact Nancy as soon as possible to secure your slot in the busy schedule. 25/09/12 – RUG in London. I am pleased to now confirm further details for the Revelation User Group (RUG) meeting to be held in London on Tuesday 25th September. The RUG is aimed at ARev and OpenInsight developers, MultiValue developers in general (Universe, Unidata, D3, QM, etc.) and also end users that are using MultiValue technologies. The RUG shall take place at the Hilton London Metropole Hotel, 225 Edgware Road, London, W2 1JU and all of the sessions shall be undertaken in one meeting room, with lunch provided and served in the restaurant. The day shall begin at 09.30 for Coffee and Light Refreshments with the first formal presentation beginning at 10.00. Mike Ruane (President and CEO, Revelation Software, Inc.) will take this first session to talk about where Revelation is at the moment, the organisation’s roadmap going forward (64-bit OI, system management module, etc.) and he will also take a hands on look at some of the new features in the recent OpenInsight releases, including the O4W enhancements and the brand new MVBFS (single code based for the popular MultiValue and SQL Data Connectors). We will break for coffee at 11:30 for fifteen minutes and then I will take a 45 minute session in which we will take a quick look at the reporting options in OpenInsight and the new Banded Report Writer specifically. Reporting has gained a higher profile in recent years, with management and users needing more information and many wanting to take more control over ways of getting it onto paper. We will not look at the highly technical reporting solutions that professional developers can create for their users using OpenInsight, but we will look at how the BRW can be used by developers and power users to quickly pull printed information together. Lunch will be provided to all attendees in the Restaurant between 12.30 and 13.30, following which Andrew McAuley (Managing Director of Sprezzatura and RevSoft UK) will talk about Sprezzatura’s recent experience with an O4W project. This session shall look at how developers can push the tools using css to quickly create some nice looking web based solutions using the O4W wizard technology. Following a short coffee break at 14.30 till 14.45, Mike will once again take the floor and continue his look at the new features and enhancements in the recent versions of OpenInsight. He will also welcome your suggestions for new features that will make your use of OpenInsight even easier and your solution more saleable. Following Mike’s session there will be an opportunity for you to network and continue your conversations in the hotel’s bar area. Previous RUGs have demonstrated how valuable these sessions are to our EMEA users and MultiValue developers who are considering web enabling their character based applications or simply providing their users with a GUI front end. OpenInsight delivers on these needs and much, much more. Please contact Martyn if you have not already reserved your place and wish to talk about the benefits of attending in more detail. OpenInsight 9.3.2 now available for download. Revelation Software has now completed the beta phase of the 9.3.2 release and the commercial release is now available for download from the WORKS area on www.revelation.com. If you are a WORKS member you can get the upgrade files in the usual way. If not, please contact m and I’ll discuss how you can get onto the WORKS program for all OpenInsight upgrades, support, etc. This new release includes enhancements to OpenInsight for the Web (O4W v1.4) and the new Multivalue Base Filing System (MVBFS). O4W v1.4 includes enhanced OECGI3P.PHP to provide better performance in fast cgi situations, initial deployment of new engine server functionality, added “pattern validation” in the form designer, provided a “READY” event for forms and reports, added the ability to use repository entities for template and css, and O4W Mobile enhancements. The MVBFS is Revelation Software’s single code base for the dedicated data connectors that enable the company to support disparate database technologies within the OpenInsight environment. The MultiValue connectors for Universe, Unidata, D3, mvBase and OpenQM have been combined into a single code set which is named MVBFS. This new base filing system supports rti_readu, rti_writeu, and rti_writerelease functions to allow developers to interact with MultiValue servers in a more traditional MultiValue style. Transaction logging support has also been incorporated with the rti_transaction subroutine. Also included in the OI 9.3.2 are a number of patches and enhancements for the Banded Report Writer, RevelationDotNet, OIPI.Net/OIPI, SQL Connector, Editor ++/Basic+ and RDK. I would personally like to thank all of the beta testers who took the time to road test the new version prior to release and to report back their findings. With your invaluable real-world help, you will have helped to make this another successful OpenInsight release.